When two kids from Columbine, Colorado went on a killing spree in their high school back in 1999, it took up to a full day for everyone to hear about it. It was a time before smart phones, social media, instant messaging, and the ease of Googling all the information you need. A time when news traveled the slower route of newspapers, TV and radio, email, and by word of mouth. That Tuesday, we stared wide-eyed at each other in the workplace and asked have you heard what happened? In the grocery store can you believe it? In the parking lot where did they get those guns? We walked through that Tuesday in slow-motion trying to make sense of the incomprehensible what in the hell possessed them? Given the present moment, it may be hard for you to believe that once upon a time it was beyond comprehension that of all people, children, would go into their high school with an arsenal of guns, kill and wound classmates and a teacher, and then kill themselves. Back then it seemed like everyone in America was in agreement that this was so abhorrent a chapter in America’s history that it must never happen again. We had no idea that we would be completely wrong about that, that this type of massacre would be emulated multiple times in the years to come. That it would somehow become not just a new normal in America but your normal. That we would let this happen to you. I want to acknowledge that though I love you and your brother more than anything in the world, I, and the rest of my generation, and those older than us, and those older than them, have utterly failed you. I’ve screamed, and cried, and wrung my hands. I’ve donated money to gun control causes, contacted my elected officials, and pushed for legislation in our cities and states. But none of it has been even remotely adequate. As a result, I’ve raised you in a country where “active shooter drills” are commonplace in the classrooms of even the smallest of children. 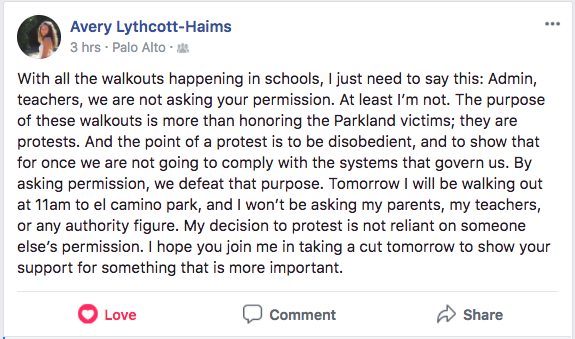 We’ve put you through the anxiety of those drills, instead of standing up for your right to feel completely safe in your schools and your childhood. And although as a parent my instinct is to shield you from every imaginable harm, I cannot even comprehend the actual harm we’ve subjected you to, let alone its psychological impact on you, because I did not grow up in your America. Your generation — the post-Columbine generation — is, without a doubt, the voice the gun control movement needs. Your youthful idealism demands to know not what is practical but why things can’t be as they should be. You believe that anything is possible. And the NRA with all its money and influence may just have met its foe in you. You’ve exposed the false logic of their infamous rhetoric. (If guns don’t kill people, then what killed my classmates?) You’re not ‘capitalizing on a tragedy’ because this is your tragedy. Your beautiful, insistent, and clear voices are hitting their intended target. Even folks with their fingers in their ears feel the reverberation of your strong message. Yet your generation worries about taking a stand. When the #NeverAgain protests started to brew, some of your contemporaries — in our town and in towns across the nation — worried that a decision to walk out of school might harm them down the road, in the form of punishment from the high school or when it came to getting admitted to college. I furrowed my brow in frustration as I read of these concerns as I saw in them the all-too-familiar evidence that these days the college admissions process leads adolescents on a leash, like a dog. I was further frustrated by the tweets and website updates from hundreds of college and university admissions offices all but granting you and your friends permission-to-protest — frustrated by this ineluctable proof that those folks know they have you on a leash. I didn’t know what to say about it, or how to say what I felt, whom I was mad at, really, or whom I was pulling for. So I walked about in a writerly daze and for two weeks pretty much wrote nothing. Then tonight, on the eve of the one month anniversary of the Stoneman Douglas shooting, in the wake of what is being said and done in your own high school, you sat down with your self and wrote up your thoughts on the matter and you made clear that at least when it comes to this issue, permission from some authority figure simply doesn’t matter to you. I read your words and my heart leapt up for you, leapt with joy at your agency. At your sense that there are some things worth fighting for, even when the fight might get you in trouble. Cuz girl I didn’t raise you to be on somebody’s leash. I know a bit from these fifty years of life, and what I know perhaps most of all is that the greatest marker of agency in life is not waiting for someone’s permission to do something, but doing what you believe is right regardless. The last time a generation of teenagers succeeded in completely upending the status quo was during the Civil Rights Movement and our un-winnable war in Vietnam (which is not to say others haven’t since tried). Countless numbers of those teens, including your auntie and uncles, took to the streets demanding to be heard. They sat down and sat in and literally put their bodies on the line. Thousands were jailed. Some lost their lives. And through their considerable sacrifices, over many years they changed the American narrative, America’s values, and the course of American history. You’re right that asking permission defeats the purpose. That sacrifice is an essential element of the narrative of protest. These kids are willing to sacrifice all of this for that, folks will say, and that’s precisely how your efforts will start to move hearts and change minds. The important movements demand and deserve your bravery, risk, and sacrifice so much so that some particular high school teacher’s or college dean’s point of view on it doesn’t even merit consideration in the analysis. And it seems you already feel in your bones that no high school transcript, college admission letter, or job offer is worth the deep regret you will feel if you fail to take a stand on an issue that matters in your soul. So hey, kid of mine, not that you need or want to hear this, but I salute the heck out of you. More than that, I’m going to walk out there too. And even though my credentials and credibility on this subject are woefully thin, if you’ll have me, I will march with you. After all, you’re my kid. My beloved daughter. I owe it to you to try to be better, bolder, and braver than I’ve been capable of being. As you take on the reality of your America, I owe you that. I pretty much owe you everything.